How Virtual Cards Help You Stay Safe When Shopping Online? Virtual debit cards are one of the most secure and convenient tools for online shopping that exist today. If you are a regular online shopper, as most people are nowadays, you need to know what it is and start using it right on! Simple enough, a virtual card is exactly the same as your plastic Visa or Mastercard but it doesn’t have a physical carrier. Instead it lives inside a digital wallet on your phone or computer. You can also buy one online, with a prepaid balance, from certain providers. It has a 16 digits card number (the so called PAN number), a CVC and an expiration date – everything you need for a web or mobile checkout. The iCard digital wallet comes with two free virtual cards, one Visa and one Mastercard. When you buy something with them, the funds are taken directly from your account balance. In case that you require a refund from the merchant, the amount will go back to your overall wallet balance and you will see it in your transaction history as “refund”. You need to be a Standard plan holder in order to be able to take advantage of virtual cards in your iCard wallet. Upgrading to a Standard plan is free with no additional monthly service fees. If you haven’t upgraded yet you can do so after going through a 5 min video identification chat with a friendly iCard agent. You can learn all about the video chat, what to expect and how to prepare, in this detailed article. Once your identity is verified you’d be able to access the details of your virtual cards. You can also customize their appearance, change their names for your convenience and also easily add more virtual cards when you need. How does it protect me? There are numerous ways for malicious artists to get their hands on your financial information online. To just name a few – you can follow a phishing link in your email or even in an SMS message. You can be deluded by a shopping website or an app mirroring a legitimate and even well-known to you seller. In another scenario, you could easily expose sensitive payment information when shopping through a public Wi-Fi network, while waiting on the airport or in the coffee shop for example. 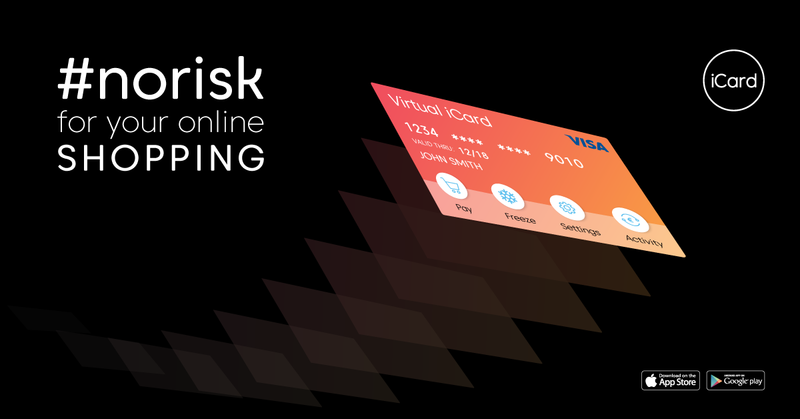 Virtual cards are a smart solution that protects you in all of the above scenarios. You’d never give access to your bank account when shopping with such a card. In addition, you can set daily, weekly or monthly limits and minimize any losses in case that you exposed your card information to a malicious actor. Bonus Tip: For maximum protection, you can “freeze” your virtual cards instantly and only “unfreeze” them when you want to use them. If your phone ever gets stolen your cards remain protected because your iCard mobile wallet requires that you identify yourself with a passcode or fingerprint login. Even in the case that someone gets access to your phone while you are still logged into the app, they cannot access the virtual cards payment details without a passcode or a fingerprint. Bonus Tip: If your phone supports Face ID you can turn that option on instead of the passcode and fingerprint login. How to use virtual cards? They are easy to use in any online store or shopping app accepting Visa and Mastercard payments. You simply need to enter the virtual card details and voilà, you are all set, just like you do with your plastic one. It is much more convenient, as your phone is at a hand distance most of the time. You can create multiple virtual debit cards and use a dedicated one for managing subscriptions, shopping on different websites or for different occasions. This is very useful for budgeting as you can set spending limits and know right away when you are going overboard. Using different virtual cards for various monthly purchases is also a great way to keep an eye on your spending. You can have a clear, visual overview on how much you spent this month on gas, groceries, fun time etc. This could help you plan better for the next month, maybe set certain limits on the things you spend most and allow more for things you usually come short at the end of the month. Bonus Tip: Use a virtual card for trials requiring payment information. Simply freeze it after you enter the card’s info and never worry about getting billed for a no longer wanted service. Virtual debit cards are not just modern and hip, they are a very much needed solution in the digital shopping world. The decision to use it or not of course stays with you. If you want to give them a try, install iCard today and enjoy online shopping with a peace of mind. As a Senior Communication Manager, Viktoriya is responsible for developing user education, activation and engagement strategies, as well as unified cross-channel product and brand awareness campaigns. In her free time she enjoys painting, traveling and gardening. Hi Kari, I am assuming your question is about how to add money to a virtual card. You need to first download the iCard digital wallet on your phone. It’s available on Google Play and the App Store. Once you download the app you need to register and create your account. Then you need to add funds to your iCard digital wallet balance by linking your debit or credit card. You can do that after you login, then go to “Account”, tap on the Plus menu and choose “Add money”. Your account comes with two free virtual cards and they will always use your iCard balance. Hope this helps. Thank you for the feedback! Enjoy safe online shopping with iCard! Jeżeli ja mam konto i kartę w DiPocket, czy ja mogę zasilić kartę w iCard. Ja widzę że mam 2 wirtualne karty i Visa i Mastercard.W sumie 4. Jeżeli 2 wirtualne, to te 2 drugie? Plastikowe? To ja nie otrzymałam ich. Czy też wirtualne? Hello Halina, the iCard blog is only supported in English as of the moment. If you require an immediate assistance, our customer support team can help you in English, Italian, French, Spanish and Bulgarian. Please contact them in one of these languages at support@icard.com and someone will get back to you within 24h. Hello, if i use iCard for shopping.. How much cost it to me? Hello Snoogy, you can use for shopping the iCard virtual cards, the e-GiftCards, your iCard visa debit or the Tap&Pay function. There are no shopping fees associated with any of the described payment methods within your iCard wallet from our side. You only pay for what you buy. Hi Nick, sorry to hear that. I suggest that you contact our support team if you haven’t done so yet to further investigate the issue. You can reach out to them at support@icard.com. They will usually respond within 24h. Hi Francesco, yes, virtual cards work exactly the same way as your plastic Visa and Mastercard. If you request a refund from the merchant, the money will go back to your total wallet balance. You will see it in your transaction history as a “refund”. Hope this helps. Thank you for your comment, please refer to our FAQ section for further assistance.